This week’s work started with a shift of the focus to explore how we, as viewers, can also construct meaning and the way in which we might interpret (and misinterpret) these constructions. In terms of images, for me, some of the most powerful are often the most simple. I see the most inspiring of these to be ones that represent family or events that I have taken part in. These for me, form ‘true images’, ones that I know the background too, where they were taken and what the situation was at the time. These are images I can rely on, to be honest, and speak to me in ways modern commercial photography can not. 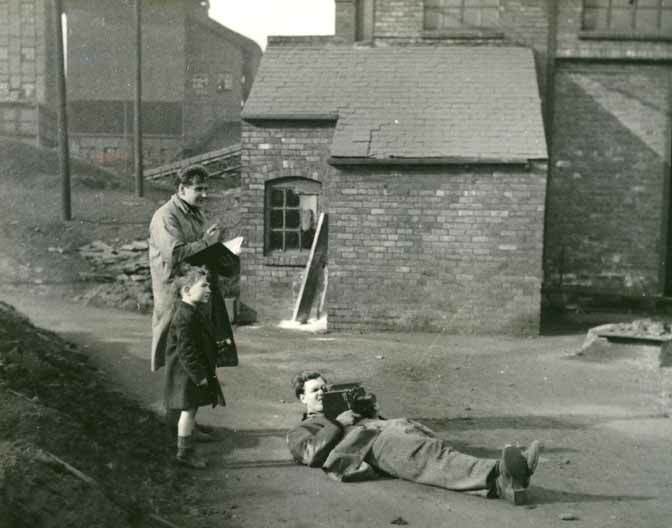 The image above is of my grandad (lying down) with the then unknown British film director Lindsay Anderson. They are at a quarry site in Yorkshire filming conveyor belts for their first documentary film, Meet the Pioneers. This is one of the images that inspired me to go into film. For me, the relationship between the images and view sits very much in the eye of the observer. The photographer merely creating a scene, that at the time seemed logical. The image above was taken as a promotional shot for the film. It did not have the intention of inspiring me to go into the film industry. I merely did that myself with the understanding of the context of the image – that being of being able to see my grandad in 1948. In terms of photography, I see the viewer as often living in the cave and the photographer as the light source that creates the shadow of new, unseen worlds. Like the slaves in Plato’s cave, the viewer is often used to a fixed way of seeing. The photographer has the ability to change their view – no matter how uncomfortable this may be at the time. It is the ‘voice’ of the story that stands out. Like the book, photography too can allow the observer to inhabit the ‘story’. The image can draw you in and surround you with an alternative reality, one that can be safe, educating, challenging, frightening or relaxing. For me, I look at the image of my grandad and I can hear a voice, a drive to go further and be more visual. This voice, for many years, was uncomfortable and my own lack of confidence drowned it out. But now this image speaks in many different ways – all of which cause me to turn from the wall of the cave and start to face the sunlight. Barthes, R. and Howard, R. (2006). Camera lucida. 1st ed. New York, NY: Hill and Wang, p.115. Kreis, S. (2012). Plato, “The Allegory of the Cave”. [online] Historyguide.org. Available at: http://historyguide.org/intellect/allegory.html [Accessed 18 Feb. 2019]. Berger, J. (1992). Keeping a rendezvous. 1st ed. New York: Vintage International, p.15.